Connect multiple audio sources to one set of headphones or speakers for simple listening, mixing, or to create a DJ style experience. 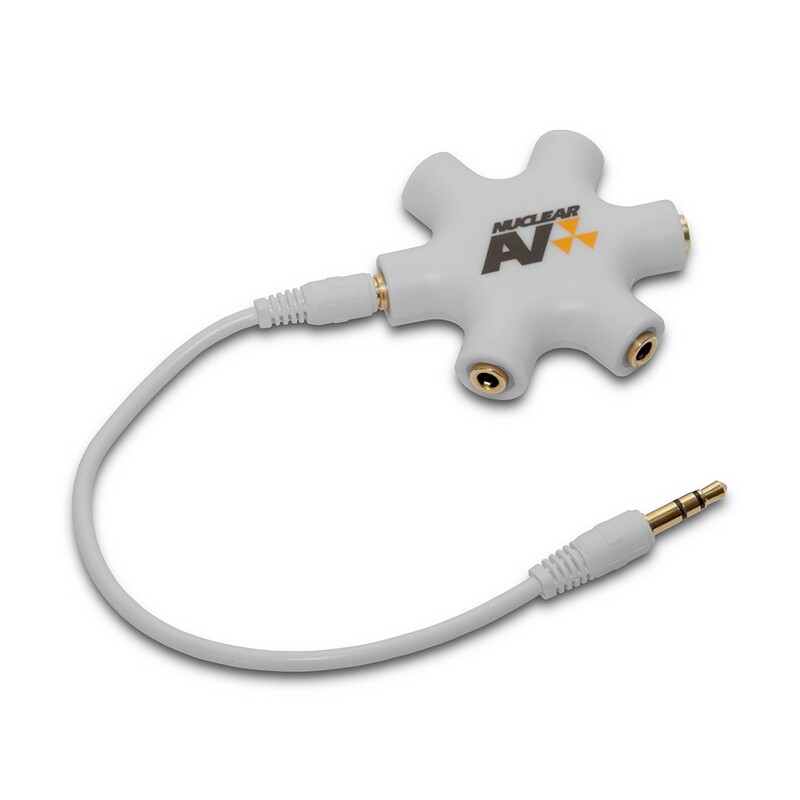 The NuclearAV Atom 5Star Audio Adapter is a versatile 3.5mm stereo splitter that allows you to connect up to five pairs of headphones to one audio source. The Atom 5Star is perfect for listening to music with friends, learning in classroom environments, or sharing a DVD in the backseat of a car. Connect multiple audio sources to one set of headphones or speakers for simple listening, mixing, or to create a DJ style experience. The Atom Adapter features 24k Gold Plated Connectors on all ports, as well as a 24k Gold Plated Connectors on the included 3.5mm connector cable. The 3.5mm connector cable utilizes EMI/RFI shielded Oxygen-Free Pure Copper Wire to ensure maximum audio clarity with minimal loss. It also comes with slimmed down connector ends allowing compatibility with most cellphone cases. These features place the Atom in a class of its own, with audio clarity not found in other headphone splitters. In addition, you can use the Atom 5Star Adapter to connect your TV or game console to any computer style surround sound speakers that use the standard AC97 5.1 triple 3.5mm "headphone jack style" connectors (center/subwoofer jack, front left/right jack, rear left/right jack) to receive simulated surround sound! The Atom 5Star evenly distributes your 2 channel stereo over all of your speakers for a room shaking experience!